I sat down yesterday to watch the NFL conference title games, this one between the Jets and the Colts, and felt I had to do something productive at the same time, so I got out my sketch book to draw. Just draw! It is a strange sensation to just sit down and draw something. You have that blank piece of paper staring at you, saying nothing! I know that there are a number of things I am supposed to be drawing, but I didn't want to deal with them. I just wanted to draw. So, this little ditty is what I came up with....ooh, I am not sure this is a good thing....Maybe there are some deep, underlying psychoses working their way to the surface here. 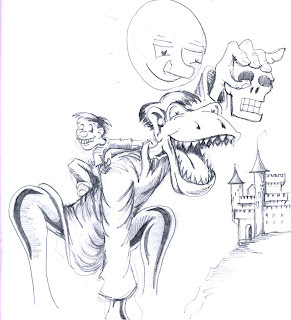 It just sort of morphed into this wierd critter holding a skull in a bizarre moonlight by a castle with a grom hanging on his back. Does it mean anything? I don't think so...just fun to draw. It was actually bringing out some of the Gris Grimley art, with an ode to R. Crumb. (the grom on the back). Who knows...anyway, enjoy the moment.